Using a ground source heat pump to cover the total building heating or cooling demand is often not economically the most efficient option. This is a result of the fact that the energy demand at full peak capacity is usually only a small fraction of the total energy demand, while at the same time the (expensive) ground source heat pump - borehole heat exchanger needs to be sized for that "once a year" peak. Usually, through analysis of the building energy profile, it is found that using only 50% of the capacity already > 90% of the total thermal energy demand is covered. Selecting the heat pump system, with the proper capacity steps, to cover this base-load, and including additional capacity for peak demand, then results in an efficient and economical optimal option. 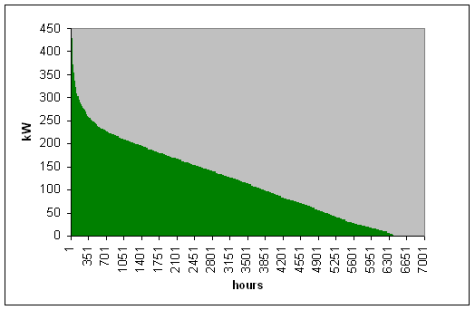 Peak demand in the graph below is 450 kW, with a capacity of 230 kW over 90% of the total demand is covered. Hybrid solutions are often both energy- and cost efficient. However the use of the additional plant needs to be integrated into the overall operational strategy of the groundsource heatpump installation.